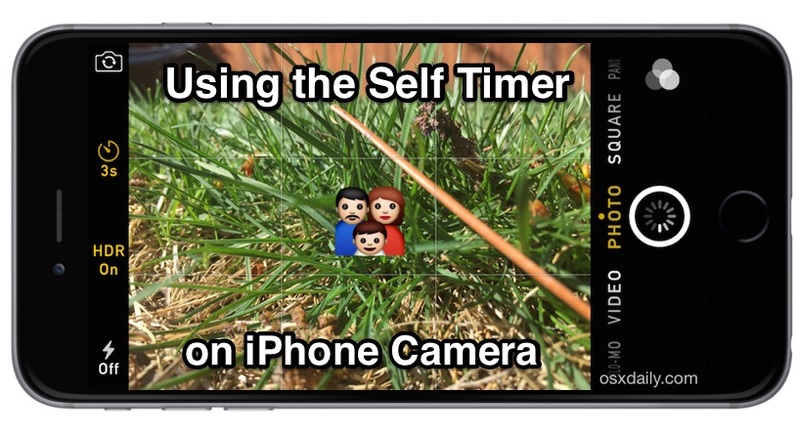 The iPhone Camera app includes a self timer function, a great feature for any camera that allows you to set a countdown timer before a picture is snapped. There’s many uses for the timer function, but it often allows for the photographer or camera owner to be in the picture frame as well, rather than just shooting pictures from behind the lens. Using the iOS Camera Self Timer feature is really quite easy, but despite the feature being right in front of the user in modern versions of Camera app, it remains underused if not just outright unacknowledged or even unknown. 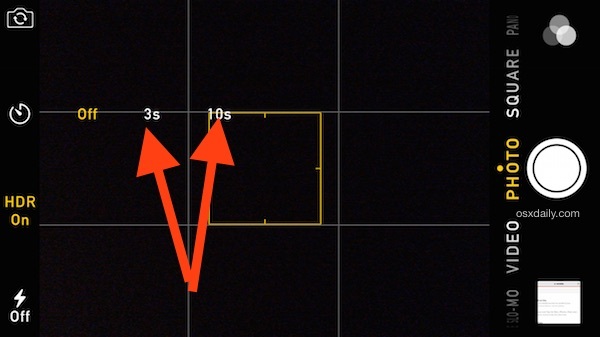 For such a helpful camera function to go unused is a shame, so let’s take a moment to review the self timer and how it works on the iPhone (or iPad) Camera application. You’ll be taking better pictures in no time. Once the timer has started, there will be a visual countdown on the Camera apps screen, as well as an accompanying set of sound effects to indicate the countdown has begun and the shutter has snapped. This is perfect for taking better pictures in general, greatly improved group photos, or even for taking selfies of yourself when you don’t want the traditional arm-extended or selfie-stick shot. The only thing the Self Timer function in Camera app is still missing is a burst photo mode specific to the timer, which is often included in third party camera applications for iPhone, and they allow for a sequence of 5-25 pictures to be snapped in a row so that the photographer doesn’t have to keep going back and forth to the camera to take multiple pictures. Burst self timing is particularly useful for tricky family shots or group pictures with a lot of people, as often someones eyes are shut or they’re pulling a face or whatever else that can make a portrait or image not quite what you intended. You can use the live filters functions on self timer iPhone shots, though there’s little need given that it’s easy to apply the filters to images after the fact. If someone in the image winds up with crazy looking eyes, remember that you can easily remove red-eye with just a quick Edit option in the Photos app as well. 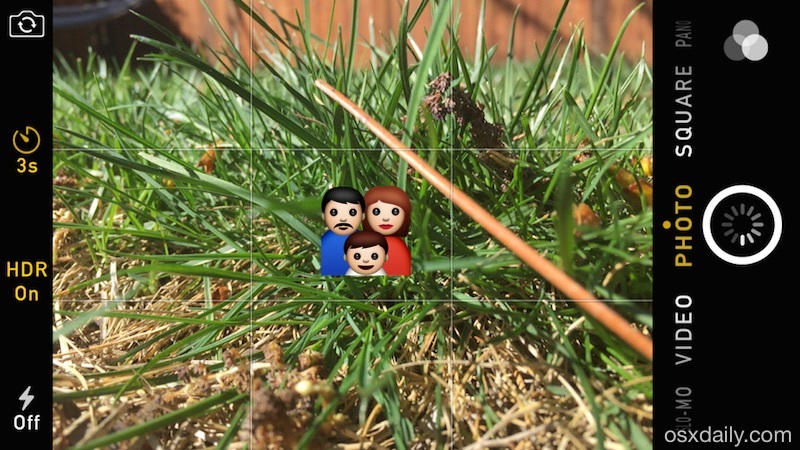 Don’t miss our many other great tricks for iOS Camera app and the multitude of handy photography tips for iPhone and iOS too. The iPhone 6 falls over when you put it on its side you have to stick it in something like a watermelon if you want to use it for self timer like this. A watermelon as an iPhone stand huh? Sounds like a potential Kickstarter idea. I don’t know why you said it doesn’t have burst mode in the self timer. 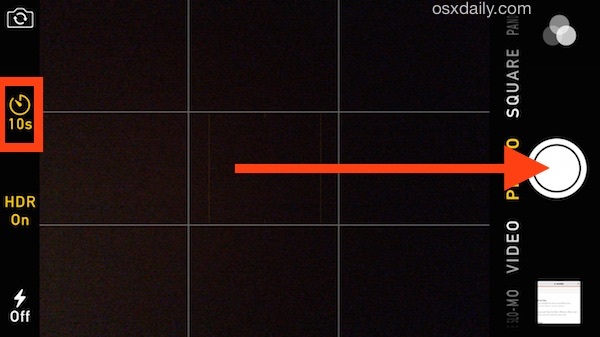 Every time I have used it it took 10 shots in burst mode whether I wanted it to or not. Ditto what Mike says: in self-timer it takes 11 shots in burst mode. I have a iPhone 5 to latest os and it worked perfect . I used the selfie mode side so I had Time to pose . I just set it at a slight lean against something solid. Thanks, now I know. The Vine app does a pretty good job of that, you hold your finger down on the screen to record and let go to stop. 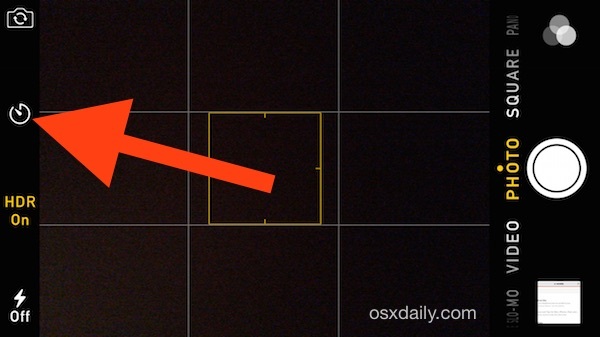 I think the Apple “Clips” app is similar too. Check them out for video, though it’s not quite intended for selfies they can work for that too.